This is an album by twin brothers: bassist Marcin Oleś and drummer Bartłomiej Oleś, collectively known as Oleś Brothers, who are synonymous with the Polish Jazz since the break of the 21st Century, recorded with German vibraphone virtuoso Christopher Dell, with whom they cooperate since many years. As the title suggests, this album is dedicated to the trio's interpretations of music by the great Polish contemporary Classical Music composer Henryk Górecki. The album presents eleven of Górecki's pieces, performed by the trio, and is appropriately entitled "Górecki Ahead", following the trio's previous album "Komeda Ahead" dedicated to the music of Krzysztof Komeda. The first public performance of some of the pieces present on this album happened just a day before this music was recorded, during the trio's concert in the Nozyk Synagogue in Warsaw, which was the opening concert of the 4th Singer Jazz Festival, of which I am the Artistic Director. Towards the end of that concert, which presented the material recorded on "Komeda Ahead", I was suddenly notified that I need to go and open another concert in another venue, which would make it impossible for me to properly close the trio's concert. In an instantaneous decision I asked the trio to just go on and play until my return, which they graciously, albeit with some surprise, agreed to, and of course since the Górecki project was to be recorded the next day, they indeed continued the concert playing the music one can now hear on this album. I was then taken by the Chief of Security of the Festival rushing across Warsaw ignoring red lights and travelling against the traffic direction, opened the other concert and safely returned to hear some closing moments of a Górecki piece and then had the pleasure to formally close the concert with the entire audience participating in a standing ovation, which lasted for many minutes. Of course this album is anything but another typical Jazz-Classical Fusion project. 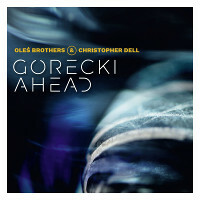 Oleś Brothers and Dell are way beyond the usual triviality and shallowness that often characterizes such projects and their attitude towards the music of other composers, both in the case of Komeda and now Górecki, is to completely absorb and naturally transform their music into a new dimension, which becomes as much theirs as it originally was the composer's. Even in a case when the listener is familiar with the original music, the trio's interpretations take him into a completely new universe, where the original music is completely altered harmonically and rhythmically. This album is another masterpiece, which expands the Oleś Brothers and Christopher Dell's long list of achievements, which covers the entire rich tapestry of contemporary Jazz, completely ignoring genre borders. The music is demanding and requires attentive listening, but at the same time it is immensely rewarding and aesthetically fulfilling, something that Culture should always strive to do. I feel happy to be able to call these musicians my friends and following their careers has been always an absolutely delightful and educational experience. This album is an absolute must to every sophisticated Jazz, but not only, connoisseur, who looks for deeply emotional and intellectual experience every time music is in the air! Superb stuff! Piotr Schmidt w World Orchestra Studio !! !